Welcome to my MINI's ("Trouble") garage thread! On the first page I've included my original post on m|u, my first tentative mod list, my current mod list, and all the (good) pictures from all the pages of the thread. Feel free to leave comments or questions if you have any, and thanks for popping in! My fascination with Mini's goes back to 2003 (ooooh long time... ) when my mom bought Mini #168 from Brecht Mini in San Diego, CA. Since then, I'd been driven around in the little Fun Box for the last 5 years until I finally got up the nerve to learn to drive stick in November of last year. I had the Mini for about 2 weeks, during which time I met Larryhermann, theiceman, Jacqtheshark, Hollis, and Hairball at the Carlsbad meet. They gave me a card with the site, I checked it out, and you guys helped propell me into Mini Mania (some call it an addiction - it's not. Just true love...). Anyways, below is Mini Cooper #168. He has no pet name - I just call him Mini - but he's so much fun, even as a pure stock Cooper. Without further ado, I give you MINI!!! Puma, when do you think you'll be getting your MINI? So I show up to my moms house expecting to celebrate her birthday (we share a b-day. Kinda cool! ), and after hanging out for a while, she hands me a box. The box was small. It had something in it. It was a key. It was a key to the Mini. OMFG I HAVE A MINI!!!! 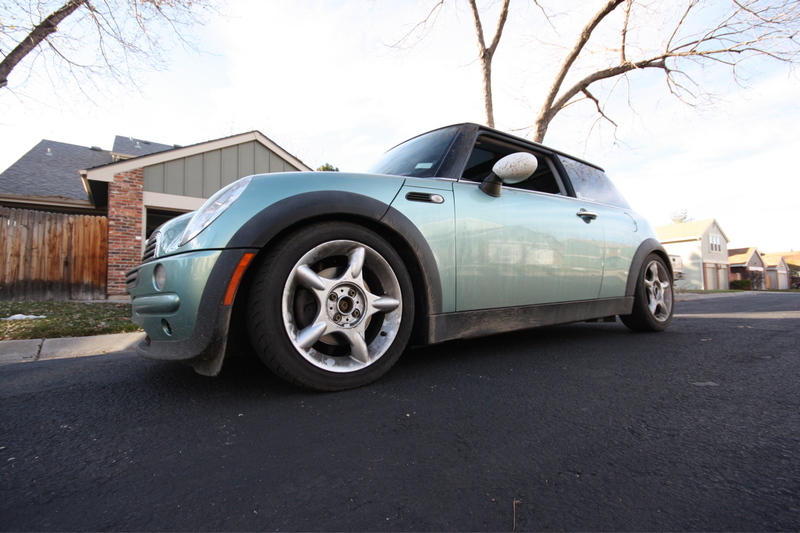 Mini has been officially renamed "Trouble," and I am in the process of deciding what mods I'm going to do. I'll be starting with cosmetic stuff since I don't have the cash to throw down for engine mods, but you'll be seeing alot of posts from me on all sorts of modding stuff. I'm so freeking excited!!! YAYAYAYAYAYAYAY!!!!! Other suggestions? 17" or 18" x 7/ 7.5"
Shaved Badges (Mini and "Cooper"), Replace "Cooper" with "R50"
If you've seen Indigo's Car, Josh, expect something like that. It'll be a gnarly, race inspired, leather/ suede/ carbon fiber beast with teal stitching/ accents. Clean the whole damn bay! Last edited by Puma; 03-02-2010 at 05:29 PM..
Hey, I recognize that MINI. 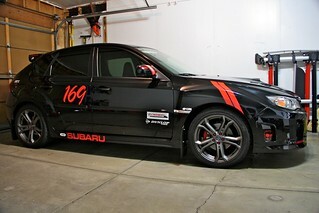 That's the one that never parks by the other MU members when we form a monthly meet!!! hah. kiddin' man. Hell yeah in rare as hell Silk Green at that!!!!! Last edited by Puma; 03-08-2010 at 05:32 PM.. Suspension from school? WTF? What happened? Great looking MINI BTW. yeah, partying like that is fun for a bit, then you realize what it really costs you down the line. At least you learned while young, keep your head straight and hit the books hard, then you will have all the green to buy all the MINIs you want!!! ps...kudos for being honest and owning your screw up, and admitting it. Takes a big man to take responsibility and admit it publicly. I definitely feel you there! Glad to hear that you'll be going back though to bring all that back up to a sparkling 4.0 right? Great looking Mini...the Silk Greens are very rare indeed! Dude, your Mom is an OG! 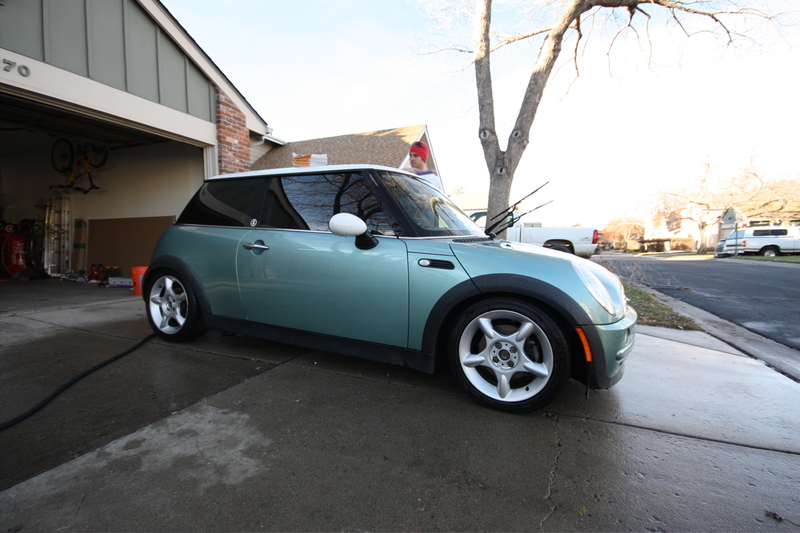 I love silk green but MINIs weren't even on my radar when it was available. I think Brian might be the only other person on here with one? Thanks guys, I really do appreciate the kind words. I'll get us some more photos tonight at the San Diego meet! Last edited by Puma; 03-06-2008 at 06:54 PM..